It was understandable that the visiting New England Black Wolves arrived at Scotiabank Saddledome on Saturday labeled as underdogs. After all, they were on the road and had just traded away their leading scorer of a year ago in Kevin Crowley. Calgary, on the other hand, was playing at home, winners of their last three and just received a huge boost to their line-up with the return of their leading scorer, Curtis “Superman” Dickson. However, that is why they play the game and it was the Black Wolves who exploded out of the starting blocks and never looked back on their way to a 16-10 victory. The Black Wolves got production from their entire forward unit. Stephan Leblanc finished with a team high three goals and six assists. Callum Crawford had 2G/6A, Reilly O’Conner had 4/G/2A and Tyler Digby, in his first game against his old team, scored twice and assisted on two more. New England played a near-perfect opening quarter, jumping out to a 4-0 lead just six minutes into the game. Calgary hurt themselves with a number of sloppy offensive possessions that resulted in turnovers. The Black Wolves took full advantage of those additional possessions and built themselves a 6-2 lead after a quarter of play. The Roughnecks cut the lead in half early in the second when rookie defender Reece Callies received an outlet pass from Del Bianco and promptly tucked in his first NLL goal beating Doug Jamieson to the far side. New England answered right back, stinging the Roughnecks for two goals in a minute. The quarter would see hostilities break out at the 11:20 mark when Greg Harnett and Colton Watkinson dropped the gloves behind the Calgary net. Both were given fighting majors and the teams would head into halftime with the visitors ahead 9-4. New England would again come out and torch the Roughnecks to start the third. This time it was Leblanc, Crawford and Watkinson finding the net in a span of 3:56 to extend the lead. Calgary finally got clicking late in the third and scored four of the last five goals bringing the score to 13-8. A quick goal to start the fourth by Ryan Martel had the home team within four, but that’s when the Black Wolves stepped on the gas one more time and put the game away once and for all. Crawford, Digby and O’Connor went back-to-back-to-back to douse any hopes of a comeback and secure a New England win. Aside from all the offensive numbers, the Wolves received a solid goaltending performance from Doug Jamieson, who made 44 saves on 54 shots for his first NLL win. David Brock stood out on a defense that played terrific from start to finish. Brock not only finished with seven loose balls and five caused turnovers, but also factored into the offense with a goal and an assist. For the Roughnecks, this is a game they will likely try and put behind them as quickly as possible. 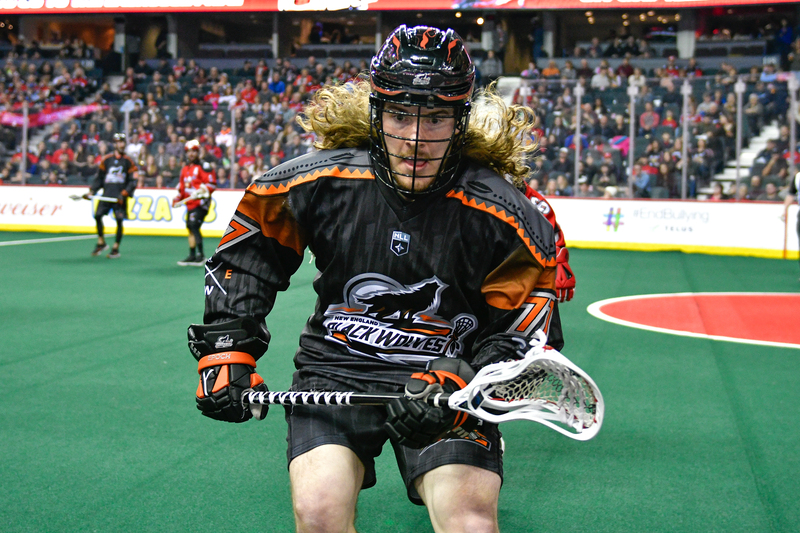 Dobbie led the Roughnecks with four goals and three assists and currently sits second in NLL scoring with 30 points. Ryan Martel and Chris Boushy each chipped in with two goals apiece, while Curtis Dickson had three assists in his first game back. Christian Del Bianco gave up 16 goals on 44 shots and was eventually replaced by Tyler Richards in the fourth quarter. 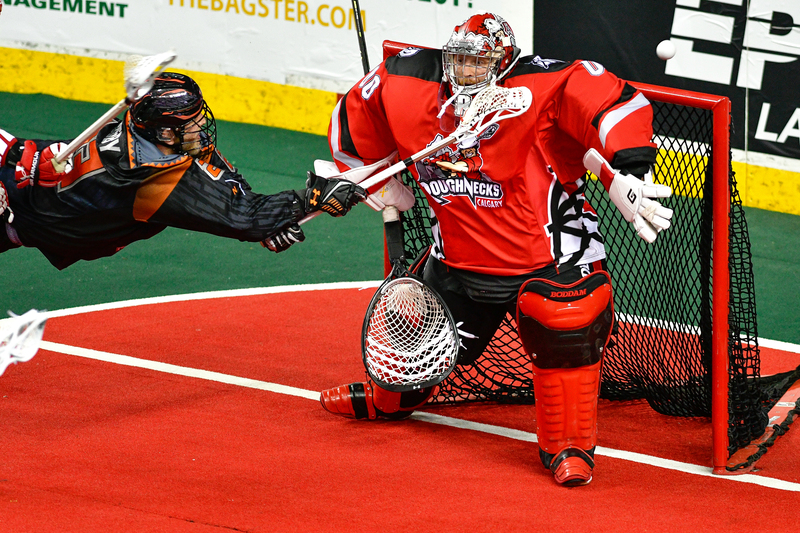 The Roughnecks will play two road games next week. On Friday, they will be in San Diego to take on the Seals before traveling to Colorado to take on the Mammoth in another Sunday matinee game. The Black Wolves will return home to the Mohegan Sun Arena to take on the Georgia Swarm on Saturday night.